As mentioned earlier, Acer Malaysia is about to launch the brand new Aspire Switch 10 2-in-1 notebook in our market today. However, Switch 10 is actually just one of the agenda as there are couple of more products that Acer will unleash today covering laptops, Android tablets, and All-In-One PCs. In addition to the Switch 10 which is priced at RM 1399, the new Acer Iconia Android tablets are also part of the launch. There are two of them here, with both are powered by 1.6GHz Intel Atom Z2560 processor: the 7-inch Iconia One 7 and Iconia A1-830 which are priced at RM 399 and RM 599 respectively. Apart from that, there’s also the 15.6-inch Aspire ES1-511 notebook which is priced at RM 999. As for the All-In-One segment, Acer Malaysia brought forward the 23-inch Aspire U5-620 and Aspire Z3-615 as well as the smaller 19-inch Aspire ZC-606. They carry a price tag of RM 3499, RM 2399, and RM 1299 respectively. All of these product will be released into market this week with the exception of Iconia One 7 which will be out slightly later in July. 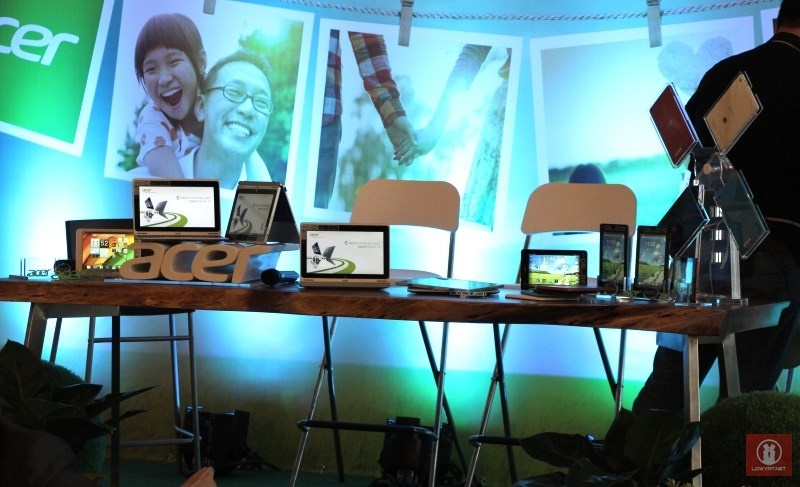 Stay tuned for further look at these new devices from Acer Malaysia coming your way very soon.